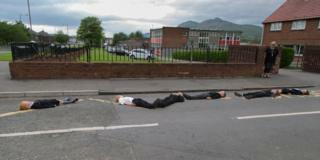 Pupils have "played dead" on the street outside their Clackmannanshire primary school to highlight road safety. Banchory Primary School Parent Council said the "unusual and dramatic" move followed recent "close calls" near the Tullibody school. The council hope the idea, involving P1 to P3 pupils, will encourage safe and legal driving and parking. Its chairman Alastair Freck told the Alloa Advertiser that the campaign "had caused a bit of a stir." He said: "It is a bit unusual and a bit dramatic, but seems to be having the desired effect because people are already talking about it. "And though it's caused a bit of a stir, it has been mostly well-received." Mr Freck said the safety campaign was "not about blaming parents". He said: "We just want people driving near to the school to consider where and how they are parking and to make sure they are doing so safely and legally. "There have been a quite a few close calls in the past and generally speaking some of the kids can find it hard to cross roads and get to school."